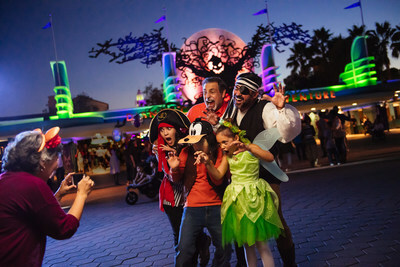 ANAHEIM, Calif., April 17, 2019 /PRNewswire-HISPANIC PR WIRE/ — Disneyland Resort is bringing a new event to guests of all ages this Halloween season with Oogie Boogie Bash – A Disney Halloween Party, at Disney California Adventure Park. This unforgettable night of Halloween fun is packed with exclusive new entertainment, from the new “World of Color” spectacular – “Villainous!,” to an interactive “Descendants”-inspired dance party, a stage show with Mickey Mouse, and a mysterious Disney villains walk-through experience. Oogie Boogie Bash – A Disney Halloween Party will add to the fun of Halloween time, celebrated throughout the Disneyland Resort from Sept. 6 through Oct. 31. At the new Oogie Boogie Bash – A Disney Halloween Party, Oogie Boogie (from “Tim Burton’s The Nightmare Before Christmas”) has cast his spell and he summons the Disney villains to scare up some thrilling surprises. All of Disney California Adventure takes on Halloween flair for the party, from special music and décor to character encounters, treat trails and new live entertainment experiences. Oogie Boogie Bash, which takes the place of Mickey’s Halloween Party, will begin Sept. 17, for 20 select nights. The after-hours party treats guests to multiple new experiences that are fun for the entire family, including the new “World of Color” nighttime spectacular, “Villainous!,” a villain-themed walk-through experience at Redwood Creek Challenge Trail, immersive treat trails featuring Disney villains, the DescenDance interactive dance party, and more. Adults and children are encouraged to dress in costume for the party as they trick-or-treat throughout Disney California Adventure for a scary good time. Guests may check Disneyland.com/HalloweenParty for Oogie Boogie Bash costume policy guidelines prior to their arrival. The new “World of Color” show, “Villainous!,” exclusive to Oogie Boogie Bash. In this nighttime spectacular, Oogie Boogie weaves a Halloween tale about a young girl (and all-new character) named Shelley Marie. In “Villainous!,” Shelley has a decision to make about her Halloween costume for this year, and finds herself wondering if she could really be as strong and unique as some of her favorite Disney characters. This twisted tale carries Shelley on an unforgettable journey, exploring the villainous side of Disney characters through fountains, lights, lasers, projections and special effects. “Villainous!” shows guests that, deep down, there’s a little villain in all of us. New and wonderfully wicked, fully immersive treat trails throughout Disney California Adventure, where guests may enjoy trick-or-treating under the watchful eyes of iconic characters such as Mad Hatter from Tim Burton’s “Alice in Wonderland,” or even Oogie Boogie himself. Additional treat trails will feature oversized cauldrons full of treats for all guests at Oogie Boogie Bash. The new DescenDance, a pulsing party in the Backlot area of Hollywood Land, inspired by the popular “Descendants” franchise from the Disney Channel. Here, guests will find so many ways to be wicked. As the DescenDance begins, a spell is cast, summoning the greatest dance crew from the Isle of the Lost to throw down and lead everyone in moves that are set to the biggest hit songs from the “Descendants” films. Once the DescenDance crew returns to their realm, the Backlot DJ continues to spin tunes that will make any “villain kid” proud, inviting everyone to step onto the dance floor into the night. The guest-favorite “Frightfully Fun Parade,” which will come to Disney California Adventure park for the first time. The Headless Horseman of Sleepy Hollow arrives on his ghostly black steed just ahead of the parade itself, carrying his flickering jack-o-lantern. He heralds the arrival of Mickey Mouse and Minnie Mouse who lead the cavalcade of characters, including Jack Skellington and many mischievous Disney villains who are ready to stir up some trouble along the parade route. The new Mickey’s Trick and Treat show, perfect for young guests, at the Disney Theater in Hollywood Land. This new, interactive stage production invites guests of all ages to join Mickey Mouse and his pals as they throw a one-of-a-kind Halloween party that include dancing, not-so-frightening scary-tales, and candy. Entry to Disney California Adventure Park before the party is included with an Oogie Boogie Bash ticket. The party begins at 7 p.m. PST and guests have the opportunity to play in Disney California Adventure for three hours before the party starts on Tuesday and Thursday nights (excluding Oct. 29 and Oct. 31) or four hours on Sunday nights, plus Oct. 29 and Oct. 31.